Today’s headlines are full of heart-wrenching accounts of desperate men, women and now, children, said to be suffering from mental illnesses categorized as incurable. Instead of receiving relief from their symptoms and the alleviation of their ailments when seeking help from their doctors, they receive a life sentence of deadly, psychotropic drugs – the primary treatment method of psychiatrists and general practitioners who write millions of prescriptions a year without understanding the etiology, or cause, of mental diseases – maladies that are indeed curable by means of drug-free alternatives. The El Gilani Methodology (EGM), is such an alternative – proven to cure so-called ‘incurable’ mental and physical disorders through the use of a standardized and scientifically tested system that heals disease of the mind, body and soul by utilizing selected portions of the Holy Quran and other supplications, as well as use of the projection of the visual image of the personal names of Almighty God, Allah, and His Holy Last Messenger, Muhammad, peace be upon him. Studies show that in the last decade, mental illness in the U.S. has increased by fifty percent; over a quarter of all Americans have a mental disorder. Reuters news service recently reported that over 168 million Europeans suffer from mental diseases, and the U.S.Centers for Disease Control claims that over 10 million Americans a year contemplate or plan to commit suicide. The answer from psychiatrists to this alarming epidemic: drugs. In the field of psychiatry, where no mental disorder can be medically diagnosed, or physically attributed to a defect in the body, the astonishing answer for those who are suffering is dangerous, psychiatric drugs. Where are the true practitioners ? His Eminence El Sheikh Gilani’s riveting expose’, The Ultimate Fraud of Freudists, contains the history behind the EGM and its sufic origins, as well as details of the methodology, case studies and subsequent cures. “All the Holy Prophets, from Hazrat Ibrahim (Abraham) to the Last Messenger of Allah, have left the Sufis a rich heritage of psychiatry. Apart from guiding mankind, these Divine psychiatrists healed people by reading over them chapters or lines from Holy Quran and prescribed prayers of the Holy Last Messenger, peace and blessing be upon him. Sufis have the unique privilege of knowing these secret prayers and lines which were used by Hazrat Ibrahim, Hazrat Musa (Moses), Jesus, son of Mary and the Last Messenger of Allah. Healing suffering people was neither the aim of messengers and Sufis, nor is it considered a great feat. As a matter of fact, no sufi would ever like to be known as a healer,” states the founder of this revolutionary, yet timeless healing modality, His Eminence El Sheikh Syed Mubarik Ali Gilani. • 42,000 deaths a year occur related to psychiatric drugs, how many cures? • What will happen to the future of the children who are now taking these powerful drugs? • 1 in 6 pregnant women are diagnosed with a mental disorder and put on medication; exposing babies to these horrible drugs while their still in the womb. The CCHR has expedited the litigation of numerous cases where individuals were committed to psychiatric hospitals against their will. Their leads have spawned investigations of mistreatment and involuntary confinement, and even the deaths of people falsely diagnosed as having mental disorders, and have been instrumental in the prosecution of unscrupulous doctors. In the CCHR, the public has a worthy advocate of the people’s right to total honesty, integrity, and quality in mental health care , and of legal protection against abusive, criminal perpetrators of what is indeed one of the worst of crimes against humanity. His Eminence Dr. Gilani has, for more than two decades, offered help to sufferers of mental (spiritual) and physical diseases as a humanitarian service and gesture of good will for the Sake of Allah, and continues to extend the miracle of healing, by the power of the Almighty Creator, to those who believe in One Almighty God, follow Ten Commandments, and strive to live a sober life avoiding amoral actions. From 1976 to 1977, the world received the first scientifically controlled proof of the effectiveness of the El Gilani Methodology (EGM) to cure various mental and physical diseases. For over 11 months, El Sheikh Gilani demonstrated and documented the healing qualities of Holy Quran before an international panel of doctors and psychiatrists at the Psychiatric Research Center of Shahar Hospital, in Taif, Saudi Arabia. Patients suffering from schizophrenia, chronic depression, epilepsy, insomnia, night fright, chronic join pain and more, were completely healed, while members of the Saudi press and the world looked on. Never before had the efficacy of Quranic Therapy been investigated under strict scientific conditions, in such a public venue. All doubts regarding the effectiveness of Quranic Therapy (the El Gilani Methodology) were removed. The conclusive results were undeniable and recognized by Muslim Ulema (highly educated scholars) and Ummah ( the worldwide Muslim community) alike. His Eminence Dr. Gilani even demonstrated the positive effects that recitation of Holy Quran causes in other living things in a trial using two identical plants: twice the rate of growth was recorded in the plant over which the sacred lines were read as the one over which no Holy Quran was recited. The Glaring Reality – Modern Medicine and Psychiatry Cannot Cure! In a typical case, psychiatrists diagnosed a patient as suffering from a chronic mental disorder or insanity, without knowledge of the cause(s). The general treatment regimen consisted of a variety of drugs, and often electric shocks, which masked or subdued the negative, anti-social, violent or destructive behaviors of the patient, none of which were able to cure the sufferer’s psychiatric ailments; when the drug therapy is halted, the symptoms return. Once the regimen of Quranic Therapy was begun by Dr. Gilani, invariably, in all patients, medications were gradually decreased, as the patients’ conditions improved until – due to the healing achieved by the EGM treatments – the psychotic drugs were no longer required . Ismail A. Aziz exhibited all of the qualities of a normal, well-adjusted and studious person throughout his primary and secondary education. However, after graduation from high school, his habits shifted to include many typical immoral behaviors such as indulging in substance/drug use and intoxicants, watching television, and listening to music. It was not until he relocated to New York City that he began to suffer from paranoia and insomnia. When his symptoms became extreme, his mother made arrangements for him to receive Quranic Therapy treatments, as she sensed that the source of his problems may be spiritual. Mr. Aziz decided to discontinue the treatments before their completion, turning to life in the streets that culminated in his arrest by law officers after displaying odd behavior and committing vandalism. He was admitted to a mental facility and given neuroleptic drugs which rendered the young man harmless and in a stupor. Subsequently, and for a number of years, Mr. Aziz was in and out of New York hospitals as his symptoms reappeared, and temporarily subsided. Through his mother’s relentless petitions, Mr. Aziz’s case was again reviewed by His Eminence El Sheikh Gilani, and granted a second opportunity to receive a Quranic Therapy prescription – this time administered by the Honorable Dr. Hussein Adams. During the very first treatment session, a horrid,smoky, red-eyed entity emerged through the top of the patient’s head; it glared malevolently at Dr. Adams, voicing it’s intention to kill him. While continuing the administering of the EGM presecription, Dr. Adams was viciously attacked by the entity, at which time he immediately petitioned Almighty Allah for protection, and summoned His Eminence Dr. Gilani – who forthwith appeared physically in the room , positioning himself between the menacing entity and Dr. Adams, who, along with his esteemed teacher, projected the visual image of the personal Name of Almighty God ‘Allah’ on the creature, while reciting specific prayers. The evil entity then vanished! Today, at 31 years of age, Mr. Aziz is a functional member of his family and community, due to the miraculous healing of the psychosis from which he suffered for more than 16 years. By the Grace and Mercy of The Almighty Creator, the El Gilani Methodology is the means through which His Power has mended the diseased souls of countless human beings who would otherwise have been doomed to the misery of mental illness. For three months, Muhayyaddin Laville had experienced a ‘crushing sensation’ and had been seeing the silhouette of a ‘figure’ that caused him extreme fear and agitation. He became excessively afraid to be alone, or to sleep, as whenever he closed his eyes he would feel the presence of an ‘entity’ who would overtake him and begin to strangle him, attempting to kill him. The 16-year-old young man took on a haggard appearance due to anxiety and lack of sleep, which alarmed his mother and prompted her to contact the Honorable Dr. Adams, who consulted with His Eminence Dr. Gilani. The diagnosis revealed that the young man had been violating the immutable laws of The Almighty Creator to such a degree that his sins actually took on the material form of the ‘entity’ which was plaguing him. His Eminence Dr. Gilani instructed Ms. Laville to take her son to a psychiatrist in order to obtain an assessment of the young man’s condition from a medical science base. At a local hospital, a psychiatrist concluded that Muhayyaddin had a Mood Disorder and was under extreme stress, and prescribed Tylenol and Benadryl for relief of his symptoms. Upon hearing the psychiatrist’s prognosis, His Eminence Dr. Gilani was incensed at the ignorance and inability of these ‘doctors of the soul’ to cure the ailments that record numbers of patients are presenting to them, as well as the abuse which occurs when they prescribe grossly inappropriate treatment for psychiatric issues – failing miserably to relieve their patients of their suffering. He then requested that the young man confess to what sins he had been committing, and made him take oath that he would never return to such immoral behavior. A spiritually potent prayer, Du’a Kareema, was recited and by telephone, His Eminence Dr. Gilani commanded the entity to leave the young man’s body, as he had admitted his folly and obtained the forgiveness of Almighty God; the entity was warned that if it did not heed the orders, that Dr. Gilani would personally lay hold of it – one who, by the Power of Almighty Allah – is fully able to inflict a woeful consequence! The evil entity immediately exited Muhayyaddin’s body, and equally as soon, a visible difference was noticed, as his feelings of heaviness, fear, and paranoia were gone. To fully effect the cure, Muhayyaddin resolved to a 15-day regimen of invocations and worship, including the recitation of the Holy Qur’an. Although modern medical knowledge has apparently claimed the ability to pinpoint (to some vague degree) what mental disorders cause certain types of symptoms, and further – to name the chemicals, enzymes, and organic elements whose underproduction or overproduction precipitate these vague disorders – yet, supplying the missing element, enzyme, or chemical mixture does not cure these psychiatric ailments. The word ‘psyche’, which means ‘soul’, is key in understanding the deficiency of the modern modalities of treatment of ‘psychiatric’ illnesses – which, indicated by their name – are rooted in the soul. The Diagnostic and Statistical Manual of Mental Disorders, the handbook of the western psychiatric practice, swells with the additional descriptions of scores of ‘new’ mental illnesses and disorders. Modern society has summarily accepted occultism and Satanism – with their writ and ritual – and given it status of validity equal with the major true faiths of the world. Even the Holy Messenger Jesus, son of the Chaste Mary( peace be upon them), who is revered by Muslims and is a competent Master of Sufic Sciences, was confronted with the task of curing people who had become possessed by ‘devils’. In fact, the Immutable Laws for the peaceful and righteous existence of mankind have not changed; by the same token, the relationship that is intended by our Almighty Creator with human beings – His highest and select creation – is knowledge of and obedience to Him, that results in right conduct and a pure, wholesome lifestyle, devoid of the worship of satan, money, possessions, or anything save Him, immorality, crime and dishonesty, lewdness, and perversity – all epidemic today. He is The Sovereign Lord of all. The International Qur’anic Open University sincerely invites the sufferers of mental diseases and disorders, who are prepared to re-align their lives to embody the prescription for righteous living as preached by all of the Holy Messengers of The Almighty Creator, and in this modern ‘dark’ age – His Eminence Dr. Mubarik Ali Gilani extends the miraculous blessing of the El Gilani Methodology to any who have reached their limit of suffering and possess the courage to accept it. 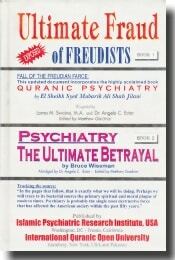 The Ultmiate Fraud of Freudists gives warnings of abuses, and hope for sufferers of mental illnesses.